We want you to have a great marriage, and we think Grace Marriage will help. As you know, life is busy, and often your marriage suffers because of it. In Grace Marriage coaching, you and your spouse will come together every 90 days (4 times a year) with other couples to proactively work on your marriage. Please note this is not marriage counseling, but rather marriage coaching. This is taking your marriage to the gym, not the hospital. During these 4 Grace Marriage days, you will work through a workbook with your spouse while seeking to apply the freeing grace of Jesus in your marriage. Included in the price is breakfast, catered lunch, and childcare. 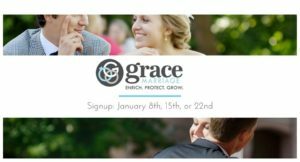 As a staff we piloted the program in 2016; so take it from us, you will love Grace Marriage! Total cost – $250 per couple. We have reach capacity for this semester’s Grace Marriage coaching. You can sign up here to be put on a waiting list for the next round of coaching. Put your name on our waiting list.